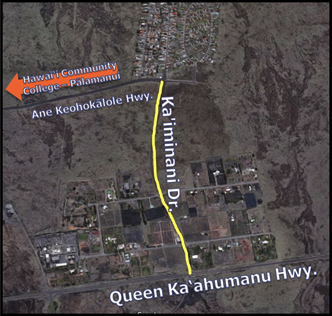 Resurfacing work on Ka‘iminani Dr., from the Palamanui (Ane Keohokālole Hwy.) intersection to the Queen Ka‘ahumanu Hwy. that was postponed due to mechanical issues and the unavailability of asphalt concrete, will begin on Monday, June 19, 2017, and completed by Wednesday, June 21, 2017. Work hours are from 8 a.m. to 3 p.m., weather and construction conditions permitting. Motorists are advised to expect delays and to drive with caution as heavy vehicles will be in the work zone. Alternating lane closures will be in effect. At a minimum, one lane of travel (for two-way traffic) will be provided at all times through the construction area.